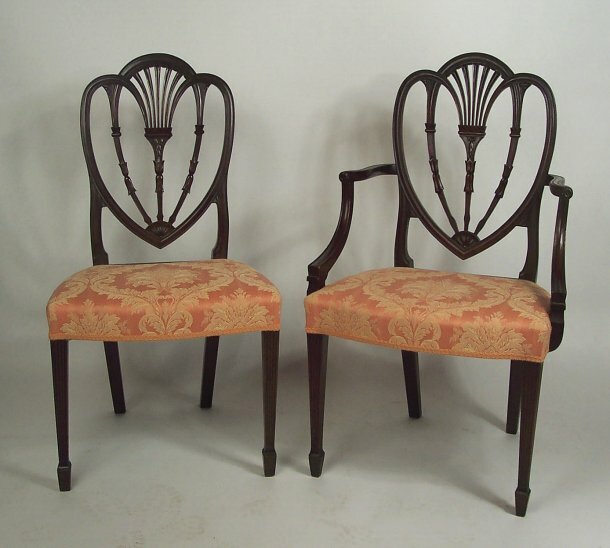 Rare assembled set of twelve carved mahogany heart back dining chairs, two arm and ten side chairs, each with bellflower, racquet and husk carved intersecting oval backs with fan carved base, above overupholstered seats, raised on square tapering reeded front legs and raking rear legs. Mid-century, attributed to Nathan Margolis, Hartford, CT. Old dark color and original condition. 39" high, 21" wide, 18" deep.